Numatic WV470 Clear Wet & Dry Commercial Quality Vacuum Cleaner AA12 2018 Model. 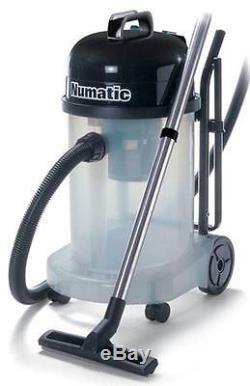 The Numatic Nuvac WV470-2 Clear Transparent Commercial Wet or Dry Vacuum Cleaner & AA12 Accessory Kit. This is the highly rated commercial quality Transparent Numatic Wet or Dry Vacuum WV470-2 which has a powerful 1060w motor and very powerful suction. The WV470-2 provides a larger alternative to the 370-380 series, with twice the capacity but to the same high performance standard be it wet or dry. What is very important is for professional use we do not mix both the functions of wet and dry operation otherwise the result can be a container full of almost MUD which becomes difficult to empty and will be detrimental to performance. All machines are wet or dry and the change from one to the other is designed to be simplicity itself exchanging a dry filter for a wet safety float valve and a change of floor nozzle, or vice versa. Although twice the capacity Numatic have added a folding handle design allowing easy movement when in use whilst also allowing compact storage. The accessory kit provides tools for both wet and dry operation with stainless steel tube sets as standard. Eco Friendly Twinflow 1060w Motor. Airflow 49 litres per second. Carpet cleaning performance class: F. Hard floor cleaning performance: F.
Dust re emission class: C. Uses easy change Numatic Hepaflow NVM-3AH Bags (1 supplied with each machine). Dimensions: 358mm x 450mm x 710mm. Colour: Clear Transparent / Black. The Numatic AA12 32mm Accessory Kit includes. 1 Numatic Pro Flo 300mm Dry Brush Nozzle (32mm). 1 Numatic Pro Flo 300mm Wet Pich Up Nozzle (32mm). 1 Numatic Grey Painted Aluminium Tube Bend with Volume Control (32mm). 2 Numatic Grey Painted Aluminium Extension Tubes (32mm). 1 Numatic 2.4 Meter Nuflex Threaded Hose (32mm). Our reputation is built on customer care and we are constantly striving to improve this aspect of our business. Our staff are fully trained to answer any questions or assist with any orders. Fast Light Limited, 2 Bessemer Park, Bessemer Road, Cranbourne Lane, Basingstoke, Hampshire, RG21 3NB. Company Registration Number: 03931735 VAT Number: 733653334. All prices shown are inclusive of VAT at the current rate. VAT invoices are supplied and enclosed with each order. If orders are received by 3.00 P. We have a very high next day success rate with our current carrier but occasionally things go wrong, please bear with us on this, as soon as we know something is not right with regard to your order we will contact you as soon as we know. The Highlands and Islands of Scotland - postcodes IV, HS, KA27-28, KW, PA20-49, PA60-78, PH17-26, PH30-44, PH49-50, ZE. Northern Ireland, Isle Of Man, and Isles of Scilly - postcodes BT, IM, TR21-25. Isle of Wight - PO30-41. Please note that we classify the Channel Islands as an international destination. The item "Numatic WV470 Clear Wet & Dry Commercial Quality Vacuum Cleaner AA12 2018 Model" is in sale since Thursday, September 24, 2015. This item is in the category "Home, Furniture & DIY\Appliances\Ironing & Vacuuming\Vacuum Cleaners". The seller is "fastlight_distributors" and is located in Basingstoke. This item can be shipped to United Kingdom.